On Tuesday, one of America’s smallest babies at birth, Connor, was finally discharged from the hospital. 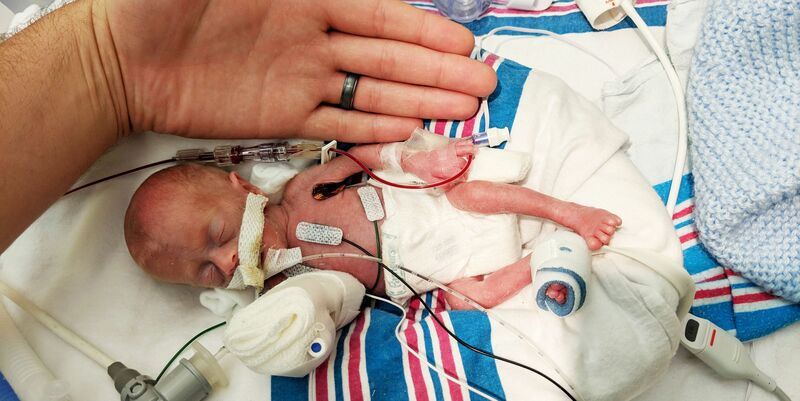 Now 8-months-old and 11 pounds, Connor was born at 26-weeks and weighed 11 ounces. Born weighing less than 11 ounces, which is, btw, about the size of a human heart, Connor, is now being dubbed the “miracle baby” by Blythedale Children’s Hospital in Valhalla, New York. The reason? Other than the fact that he was born so early—fyi, full-term birth around 39-40 weeks per American College of Obstetricians and Gynecologists—and so small? Connor suffered from “chronic lung disease, bronchopulmonary dysplasia, neurodevelopmental disorder from a brain hemorrhage, feeding issues, plus, other medical conditions,” Blythdale said in an email to Women’s Health. This sounds like a lot (because, unfortunately, it is), but health complications are common for premature babies. Simply put: “The earlier in pregnancy a baby is born, the more likely he is to have health problems,” according to the March of Dimes. That being said, this is a story with good news: Connor prevailed like the tiny champion he is. After being admitted to the hospital in December 2018 at four-months-old and 6.6 lbs, he was able to go home for the very first time (!!) yesterday at 11 lbs, more than 10-times his birth weight. This comes after months of Blythedale’s help weaning Connor off various respiratory devices helping him grow through physical, occupational, and feeding therapies. And that’s not all, guys. This little “miracle baby” is a trooper—as are his parents, Jaimie and John Florio. While medical professionals worked with Connor on his social and developmental needs at the Hospital’s Infant School, the Florios also went to, err, class by participating in the Parent and Caregiver Education program so they can best prep and care for their “medically complex” little one once discharged, Blythedale said in an email. Their Parents-of-the-Year status just goes up from here once you learn how mom and dad kept spirits up through all this time spent at the hospital. Get this: They dressed up their little preemie in fun outfits for the holidays from Halloween to St. Patrick’s Day. And the cuteness overload is real—very real. No word yet on how day one one at home has been for Connor, but I’ve said it before and I’ll say it again: Connor is already a champion.